BRAOU Distance BEd Special Education Admissions 2019/ BRAOU BEd(Special Education) Entrance Test 2019 Notification/Ambedkar Open University BRAOU BEd(SE) Admissions 2019: Dr.B.R. Ambedkar Open University(BRAOU), the Department of Education is offering B.Ed. Special Education (SE) Programme in Telugu and English media, approved by RCI (Rehabilitation Council of India), from the Academic Year 2009. So, BRAOU, Department of Education will issue the BEd(SE) Entrance Test 2019-2019 Notification in this Month and the University will invite the online applications from the eligible candidates for admission into BEd(SE) through Entrance Test. This notification Eligibility Criteria, Educational Qualifications, Age limit, How to apply, online application form, last date for apply, exam date, registration fee, course fee, hall tickets, results and more details are provided here. B.Ed. (SE) programme is being offered through distance mode by Dr. BRAOU, Hyderabad. It aims to develop professionals for special education within a broad perception of education in the twenty first century. The programme is intended to train the professionals to enable them to imbibe knowledge, understanding, attitude and skill to impart education effectively to the disabled. The B.Ed. (SE) programme of Dr. BRAOU aims to enable the Trainee Teacher to achieve the following objectives. 1. To develop a broad perspective of the role of specially trained professionals as an agent of change in the prevailing and emerging Indian Society in the ensuring age of IT revolution and globalisation. 2. To develop the confidence among the learners about their potentialities, abilities and usefulness to save the society with a sense of freedom, self respect and dignity. 3. To develop professional competencies among the learners to educate the different disabled group. 4. To understand various methods and approaches of organising learning experiences of disabled group of learners in disability area for inclusive/integrated/special education set up. 5. To understand and develop the ability to manage special schools. 6. To develop competencies to organise various co-curricular and extracurricular activities, specially for differently abled children. The medium of instruction is English and Telugu. A student should write the answers in Year-end Examination, Assignments and Records, Teaching Practice and Practical Lesson Records in the same medium which he selects at the time of admission. The Programme fee is Rs.20, 000/- for the entire programme of two years. The total fee has to be paid at the time of admission in single payment. Candidate satisfying the following requirements shall be eligible to appear for the entrance test. 2. The Candidate who has obtained any Bachelor Degree from any Recognised University i.e., B.A. / B.Sc. / B.Sc. (Home Science)/ B.Com. / B.C.A / B.B.M. are Eligible for Admission. 3. Weightage will be given to the candidates fulfilling any one of the following conditions in the Common Entrance test apart their marks obtained in the test. 7. Those appearing in Qualifying Examination (Bachelor or a Higher Degree) can also apply. But they will be required to submit the proof of having passed the Qualifying Examination at the time admission. Otherwise they are not allowed for admission. 8. Candidate should have completed 21 Years as on 01.07.2019. No upper age limit. Note: (1) As per the G.O No. 92, the candidate who passed B.E/B.Tech/ MBBS/BDS/ BPT /BAMS/ BL/LL.B /B.Sc. (ASLP)/ B.O.L B.A. (Languages) and other such professional courses are not eligible for admission in to B.Ed. (SE) course. (3) Candidate can shift their Area of Specialisation i.e. HI/MR/VI at the time of Admission as per their interest and availability of the seats in left over vacancies. 2. Candidates are expected in the examination hall by 1.30 PM. Syllabus for the subjects under Part - I, and Part - II of the B.Ed. (SE) Entrance Test is as follows. 5. Voices - Direct Speech and Indirect Speech. Candidates will be ranked in the order of the merit in the B.Ed. (SE) entrance test. In case of candidates getting equal mark, Part-C marks will be taken into account to decide relative ranking. In case of tie the marks obtained in Part-B and then Part-A will be taken into account to decide relative ranking. In the case of candidates getting equal marks in each of the parts of the test paper, age shall be taken into consideration for relative ranking among the bracketed candidates, and the older candidates shall be given priority. The rank obtained in B.Ed. Entrance Test is valid for entry into B.Ed. (SE) Programme for that academic year 2019-2019 only. Note: 1. Request for Re-Totalling and Re-valuation or personal identification of scripts will not be entertained. 2. The Qualifying mark in the B.Ed. Entrance Test for all candidates, except SC / ST, is 35. For the candidates belonging to SC / ST communities ranking will be extended below the qualifying mark. Test Centers: The Entrance Test will be held at the Regional Coordination Centres of BRAOU. OR Allied Life Sciences under Part-II group subjects and B.C.A. candidates with Biological Sciences at Intermediate level with optional Biological Sciences are also eligible. v. Social Studies: All candidates with B.A. / B.Com./B.O.L. students with Social Studies background at Intermediate level as group subjects are eligible. 7. Intermediate / 10+2 certificate. The candidate has to register his/her candidature for appearing B.Ed. 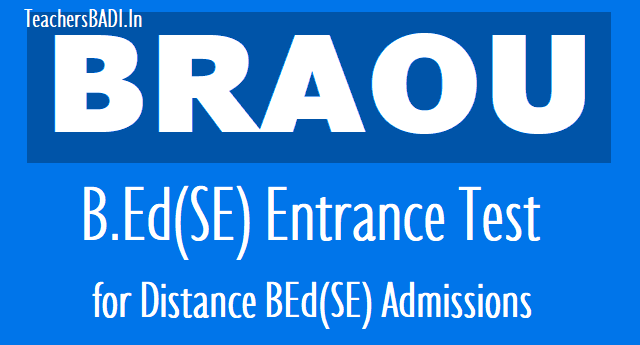 (SE) Entrance Test in University website www.braouonline.in and payment of registration fee through any AP ONLINE/TS ONLINE FRANCHISE CENTRE across the state on or before 19-07-2019. 1. Code No. 937 - Rastriya Seva Samithi (RASS), Seva Nilayam, Annamaiah Marg, Tirupathi - 517 501, Ph: 0877-2242404. 5. Code No. 945 - Child Guidance Centre, H.No. 7-6/2, Santhos Sadan, Near Uppal Bus Depot, Firjadiguda, Hyderabad. Ph: 9885035467, (O) 040-27202337. 1. Code No. 942 - Sweekar Rehabilitation Institute for Handicapped, Upkar Circle, Picket, Secendrabad - 500 003. Ph: (O) 040-27843338, 27841696. 2. Code No. 943 - Helen Kellers‟s Training College for Teacher‟s of the Deaf, H.No: 10/72, Near Sivalingam Beedi Factory, Bellary Road, Kadapa–516 001. Ph: (O) 08562-241593, (R) 08562-241593, (M) 9849311680. 3. Code No. 944 - Navajeevan Special School for the Deaf and College of Education, Door No: 4-20194S, Ayyalurimetta, Sugar Factory, Nandyal, Kurnool - 500 026. Ph: (O) 08514-245568, (R) 08514-245568, FAX: 08514-245568. 4. Code No. 940 - Madona High School for the Deaf, Camel Nagar, Gunadala, Vijayawada - 520 004. Ph: (O) 0866-2450416. Note: 1. There are 490 Seats in total (both English & Telugu media). In each Programme Centre, Maximum 50 seats per each specialised subject area will be filled, as per the choice of the candidate, medium and the availability of vacancies. The programme centre will be allotted based on the area of specialization. 2. The University doesn't shift students from one centre to another at any cost. Change of programme centre shall not be entertained under any circumstances due to administrative reasons. 3. Students shall attend workshops only at the programme centre allotted to them and not at any other centre.